O/o District Commandant, Home Guards, Darrang, Mangaldai. 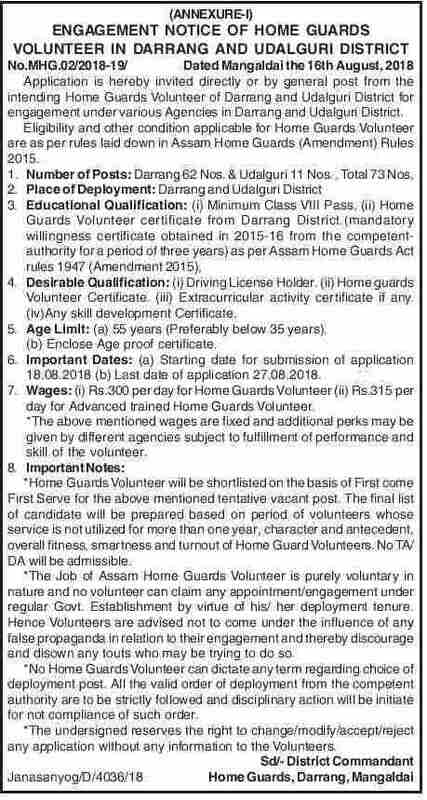 Application is hereby invited directly or by general post from the intending Home Guards Volunteer of Darrang and Udalguri District for engagement under various Agencies in Darrang and Udalgurt District. Important Notes: Home Guards Volunteer will be shortlisted on the basis of First come First Serve for the above mentioned tentative vacant post. The final list of candidate will be prepared based on period. of volunteers whose service Is not utilized for more than one year, Character and antecedent. overall fitness, smartness and turnout of Home Guard Volunteers. No TA/ DA will be admissible. The Job of Assam Home Guards Volunteer is purely voluntary in nature and no volunteer can claim any appointment/engagement under regular Govt. Establishment by virtue of his/ her deployment tenure. Hence Volunteers are advised not to come under the influence of any false propaganda in relation to their engagement and thereby discourage and disown any louts who may be trying to do so. No Home Guards Volunteer can dictate any term regarding choice of deployment post. All the valid order of deployment from the competent authority are to be strictly followed and disciplinary action will be initiate for not compliance of such order.